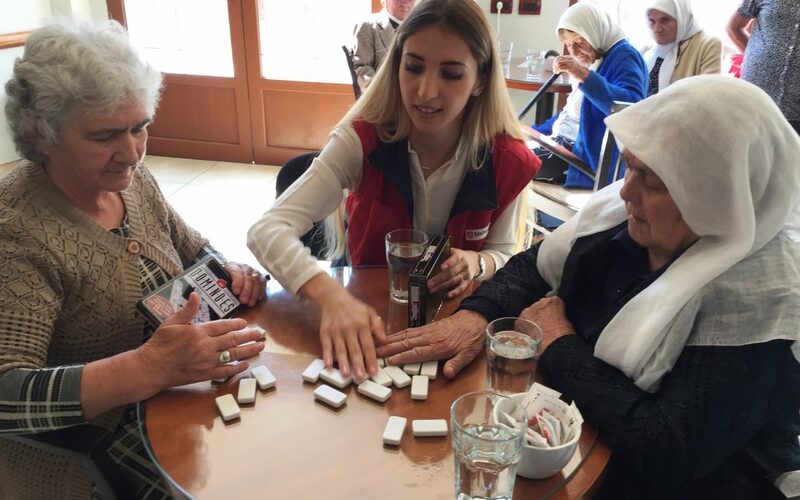 The project “Old is Gold” is run by the Order of Malta in Albania and was supported by the Fund in our St John’s Day 2018 grant cycle. A centre has been established by the Order, providing daily care and interaction for elderly people who have no resources, friends or family to support them. As well as proving basic health care and access to social workers, the centre also offers hot drinks and a chance to meet friends, read the daily newspaper and play cards, dominos or chess. Celebrating birthdays together and organising pilgrimages and field trips creates a sense of friendship and community for many elderly people who would otherwise have no one to speak to. The centre is open to all, every day, from morning until evening, and, as well as providing a comfortable place to socialise, aims to raise awareness of the hardships that many elderly people face and promote their rights to protection and social welfare. Angjelina is one of the regular visitors to the centre, where she spends time with friends and the young Order volunteers. She has no family and lives only on what her small pension can provide. With no support from the government, when her eyesight started to fail, it was the Order of Malta’s support that allowed it to be saved, meaning that she can continue living an active and independent life. For Angjelina and many other elderly people, the centre is a daily lifeline of social and medical support. Many elderly people in Albania receive little or no support from their families or the government. The Order allows them to live independent lives as valued members of their community.